Epik High is a South Korean indie hip hop group from Seoul, South Korea. The group is composed of Tablo, Mithra Jin and DJ Tukutz. The group went on hiatus in 2009 as a result of DJ Tukutz being called for mandatory military service. Epik High was relatively unknown early in their career due to hip-hop's lack of popularity in Korea. Their success began with the release of their second album, titled "High Society". Upon the success of their third album, "Swan Songs", released in late 2005, Epik High has become one of the most popular hip-hop groups in Korea. "Fly", the title song, and "Paris" (feat. Jisun from Loveholic) from their third album became hits in Korea, reaching number one on many Korean music channels as well as on online music charts. "Fly" was also chosen for the video games FIFA 07 and Pump it up, this song has now become a popular track for dancers/freestylers. 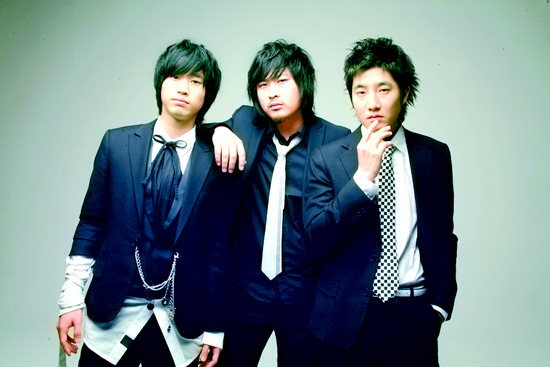 Epik High's fourth album, "Remapping the Human Soul", released in January 23, 2007 has shown a very different music style from their previous albums. "Fan", the fourth album's title song, and "Love Love Love" have been big hits in 2007. Epik High's 3rd album, Swan Songs, became a mainstream hit in the Korean music scene. Notable hit singles included Fly and Paris. The album was later repackaged as "Black Swan Songs", which included remixes of various hit songs. Their fourth album, Remapping the Human Soul, was released on January 23, 2007. The album was supposed to come out in October 2006, but the date was postponed. The album sold almost 90,000 copies in its first month and pushed Epik High to the number one spot for best upcoming artist. It went on to sell a total of 130,000 copies. The group was chosen as the best artist of the month. The group decided to head towards a 'no genre, just music' style for their fourth album. Some songs in the fourth album have been banned from several channels due to issues dealing sexual crimes, war, education and religion; the Ministry of Culture and Tourism is trying to stop air play as stated by Tablo in an interview with The Korea Times. With the title song "Fan", the album became their number one selling music album. In addition, Epik High's fame has risen in Japan with the song "Flow", which features Emi Hinouchi. They will release a CD sample in Japan. There have been offers to remake "Fly" as well as "Paris". The album sold 120,301 copies during the year, making it the third best-selling album of 2007 in South Korea. Over 50,000 copies of the fifth studio album entitled "Pieces, Part One" were pre-ordered. The first single off the new album and released music video is "One," which features Jisun from Loveholic and Korean actress Jung Ryu-won. Shortly after "One", music videos for "Breakdown" and "Umbrella" were created. After the success of "Pieces, Part One," Epik High released a mini-album, titled Lovescream. This is their first mini-album since their debut in 2003. It came out September 30, 2008. Teasers were put up on the Epik High website, which gained attention because it was made of abstract, animated graphics instead of actual actors. The mini-album gained huge success and the title track "1 Minute 1 Second" topped online music charts. Early 2009, Epik High parted ways with their old label Woolim Entertainment, and founded Map The Soul, an independent record label that currently consists of Epik High, MYK, Planet Shiver and Dok2. Epik High's seventh work, a book-album entitled "Map the Soul," was released on March 27, 2009. Now completely independent from any major label, the book-album can only be bought on Epik High's website, MapTheSoul.com. YouTube videos show Epik High's progress as they recorded and created the album with the help of other artists such as MYK, Kero One and Beatbox DG. Tablo has specifically stated that: Map the Soul is not Epik High's official 6th album but instead a special project. In May, Epik High toured various cities in the US (New York City, Los Angeles, San Francisco and Seattle) to promote their new book-album, "Map the Soul", along with Kero One, MYK and Far East Movement. On July 22, 2009, Epik High and the electronic group they scouted, Planet Shiver, joined forces and released an album with re-recorded, remixed and remastered versions of Epik Highs past hit songs titled Remixing The Human Soul. On August 14, 2009, Epik High member Tablo revealed on his blog that they are working on a new album called "[e]". On September 16, 2009, Epik High's 6th album, "(e)", was released. This album contains 30 tracks in 2CDs and a 74 page mini-book, which has interviews of each member as well as pictures. The Korean tour began on September 19th, right after the album release. The first single for (e) is "(Wannabe)" which features Mellow, and is an electronic-pop song that criticizes the current trends of K-pop. A joint music video was released for the next upcoming singles ("Trot" and "High Technology") shortly afterward. On October 15, 2009, DJ Tukutz temporarily left the group to begin mandatory military service for two years. Epik High is currently on hiatus due to this matter. However, in a video announcement released by Tablo, new unreleased songs from the group will be released sometime in the near future. Also due to the hiatus, Tablo and Mithra have started working on their respective solo albums.Before doing so, the group has recently announced that they will be releasing a special album with unreleased tracks called "Epilogue" on March 9th. Epik High had created their new album with their new song "Run" where they show a totally new reflection of what they were before. This new album contains less songs than the last one but is with dedication to all their fans and they thank everyone for all their support, as they wait for DJ Tukutz to finish his military service.